Everyone needs a battery for their 4x4. Of course our hobby can demand more from a battery than Joe Schmoe commuting to work in his Ford Taurus. Accessories like winches, cb's, stereos, amplifiers, welders, etc. can put added stress on our batteries. In the offroad world batterys take allot of abuse. You need a battery that can take abuse! Well the new trend is the sprial wound "Gel Cell" batterys. I'm testing the newest battery from Exide, the Exide Select Orbital Extreme Cycle Duty. It's of the Gel Cell design, deep cycle which is ideal for 4x4 applications. This battery has twice the lifetime as an ordinary battery, due to improved paste porosity, valve regulated lead-acid (VRLA) recombinant design, patented absorbed glass mat (AGM) separators, and high cell compression. The electrolyte is contained within the vitreous separators, which absorb acid the same way a paper towel asorbs water. 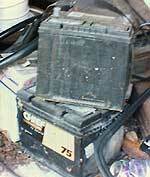 No electrolyte can leak,even if the battery is punctured or smashed. And these batterys will not vent under normal operating conditions. This battery comes with a 18 month free replacement warranty, + an extensive national distribution network, so you can always get the battery warranty coverage you need. I am very impressed with this battery which has side posts, top posts in the middle, and a dual fold away handle.